Home News Do ChIP experiment, antibody is the key! Chromosomeimmunoprecipitation (ChIP) is a classic technique for studying the distributionof intracellular proteins on chromosomal DNA. These proteins may be histonesubunits, transcription factors, or other regulatory proteins or structuralproteins that bind directly or indirectly to DNA. In general, theChIP experiment is subdivided into several significant steps: samplepreparation, protein-DNA cross-linking, cell lysis and chromatin fragmentation,chromatin immunoprecipitation, purification of DNA, and finally quantitativePCR (qPCR) Or sequencing and other methods to determine or screen out the DNAfragment interacting with the target protein. For successfulChIP experiments, choosing the appropriate ChIP antibody is one of the mostcrucial steps. Even the highest quality antibodies that perform very well inclassical Western blot validation are not necessarily suitable for ChIP. It isbest to consider the use of antibodies that have been validated explicitly inChIP experiments and validated in each batch(Eg, ChIPAb + ™ Antibody PrimerSet). Because antibodies to the ChIP assay recognise proteins in the nativechromatin state or possible cross-linked conformations or modified residues ofinterest, there may be results even for different batches of antibodies of thesame article number. If your antibody is not individually quality controlledand has been shown to be useful in ChIP, we recommend that you evaluate one ofseveral possible antibodies and then choose the one that best fits your ChIPexperiment. Specificinteractions were detected using an antibody to Trimethylated histone H3 lysine4 (Catalog No. 05-745R) by Merck Millipore. 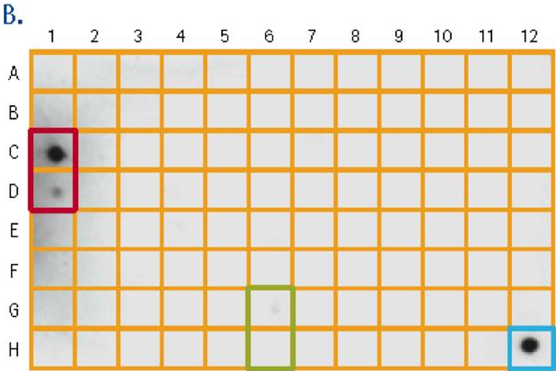 The Insurance ™ chip shows theexpected specificity of H3K4me3 peptides (9A and 9B, green boxes) withoutinteraction with other peptides. The primary antibody has a dilution of 1:2,000. Positive control rabbit IgG is displayed at 12H (blue box). Non-specificinteractions were detected using a supplier E antibody to acetylated histone H3lysine 56. 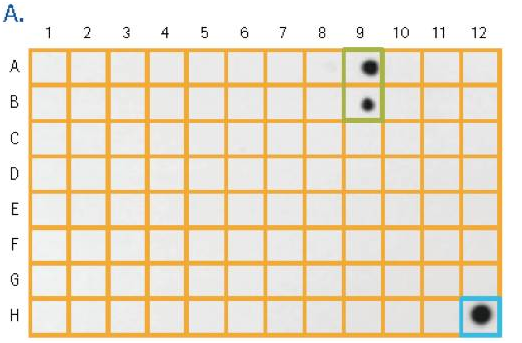 Insurance ™ chip data showed weak recognition of the target peptideH3K56ac (6G and 6H, green boxes) and strong cross reactivity with H3K9ac (1Cand 1D, red boxes). The primary antibody has a dilution of 1: 2,000. Positivecontrol rabbit IgG is displayed at 12H (blue box).